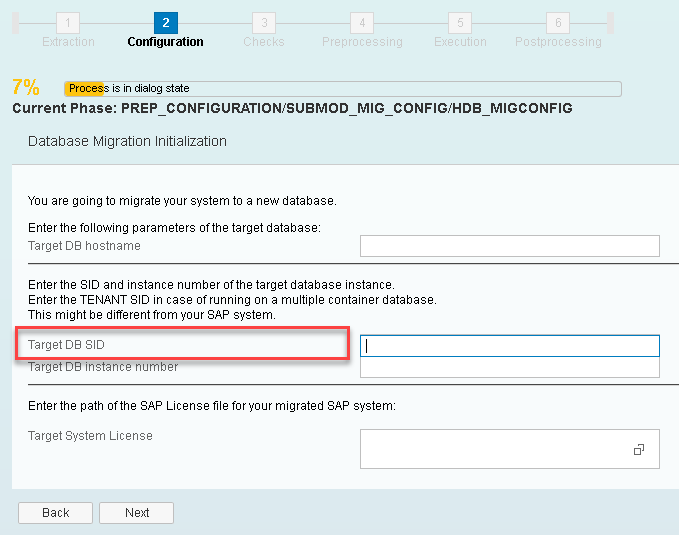 I recently stumbled across the DMO dialog Database Migration Initialization for the parameters of the SAP HANA target database, and would like to share my experience with you on the parameter Target DB SID. Note: readers should be familiar with Database Migration Option (DMO), as introduced with the blog https://blogs.sap.com/2013/11/29/database-migration-option-dmo-of-sum-introduction/. So you know about DMO as migration scenario, and you understand that the SUM tool asks for the parameters of your SAP HANA target database. So what’s the point? The point is the parameter Target DB SID, and its relation to the system-ID of the ABAP source system. Note: SAP HANA 2.0 is always MDC. You do not keep the value, but instead have to specify the existing system-ID of your SAP HANA database. SUM uses host name and instance number to connect to the database, and then checks if the system-ID is correct. So if use any other value, the tool will throw an error Wrong SID. You do keep the proposed value, and SUM will create a new tenant with that name in your SAP HANA database. You may use other values, even existing tenant names. Note: this is independent on whether you use SUM 1.0 or SUM 2.0 (see blog https://blogs.sap.com/2017/08/10/sum-in-the-family-way/).